It’s been seven years since I had to settle into a new home, so my recent moving experience has been something of a challenge for me. And, really, it’s been nine years since I last had to deal with a life upheaval of this magnitude, since the move into my home was a cross-town move, and not a cross-country move. While not fun, my husband and I decided to tackle the big stuff first. Since we wanted our new home to feel like, well, a home, we wanted to get the big stuff out of the way as quickly as possible. As a result, we did what we could to get rid of big boxes and place the big furniture. As a result, our front room was mostly set up within a couple of days of our stuff arriving so that we had places to sit, and so that we had a place that felt like home. We also got our bed squared away fairly quickly. Tackling the big stuff first also meant that we had the energy for these major projects, rather than running out of steam because we’d already spent so much effort on the small stuff. My office has been designated as a “catch-all” room. We put small boxes and other items that we’re not quite sure what to do with in that room. If you have the space, try to set aside an area that can house the small stuff. That way, it’s out of your way, and you can start to resume a normal living schedule and feel like you are “at home” in other areas of your living space. Rather than becoming overwhelmed with all you have to do, focus on one thing at a time. Just the other day, I decided to focus on getting the front room bookshelves squared away. We had the big stuff taken care of, but the bookshelves were empty. I set aside an hour to go back into the “catch-all” room, go through some of the books and trinkets, and put together a bookshelf display that reminds us of the little things that make this home our own. This works no matter what you are working on. If you are overwhelmed, choose one box to take care of, or one room to get in order. Move systemically to help you stay focused, and so that you can see progress. The first week we were here, we didn’t have most of our stuff, since the movers hadn’t brought it. This gave us time to explore a little and learn about our surroundings. We were able to try out a couple restaurants, see where the school is, and take a look around for shopping and other amenities. Even if we had our stuff that first week, we still would have set aside time to do a little exploring. If you want to settle in faster, it helps to feel familiar with the area. Learn more about what’s available, and you’ll feel more at home, since things will start to look like they should, rather than being new all the time. Finally, see if you can identify at least one thing you can enjoy, and get involved with. My son loves his new school, since there are some opportunities he didn’t have at his old school. I’m in the process of looking for a book club that I might be able to enjoy. The idea is to find at least one thing that can ground you in your new area so that you can start feeling as though you belong. 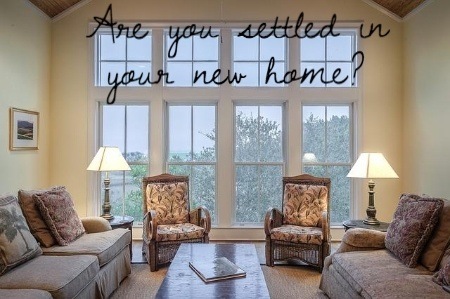 What are your tips for settling in to a new home?